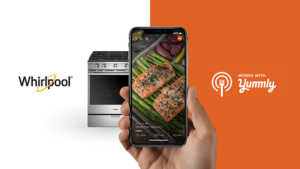 Through a series of over the air updates to both product software and the Whirlpool and Yummly brand apps, selected Whirlpool smart ovens and ranges now feature Yummly Guided Cooking. Yummly includes step-by-step recipes, video tutorials and more handy tools to make cooking a breeze. The free Yummly app is available in the Apple App Store and Google Play Store, and runs on iPad, iPhone and Android devices.